Site was level, utilities accessible, bathroom/shower house was clean and overall atmospher-most relaxing. There was a wedding reception going on that was not even disruptive. Yes in a perfect world the showers could have been a bit hotter, the WiFi could have been secure and TV reception would have gotten us the Packers/Bears game but Bronco Billy’s Saloon down the road served us well. We chose camping over staying at a Hilton! Would stay there again when in the area. We made a reservation, via phone and confirmed by email in March, 2018 for a "premium, pull-thru, full hookup" site for a June, 2018 overnight stay. We have a 2018 34 foot class A motor home towing a jeep (no dolly). 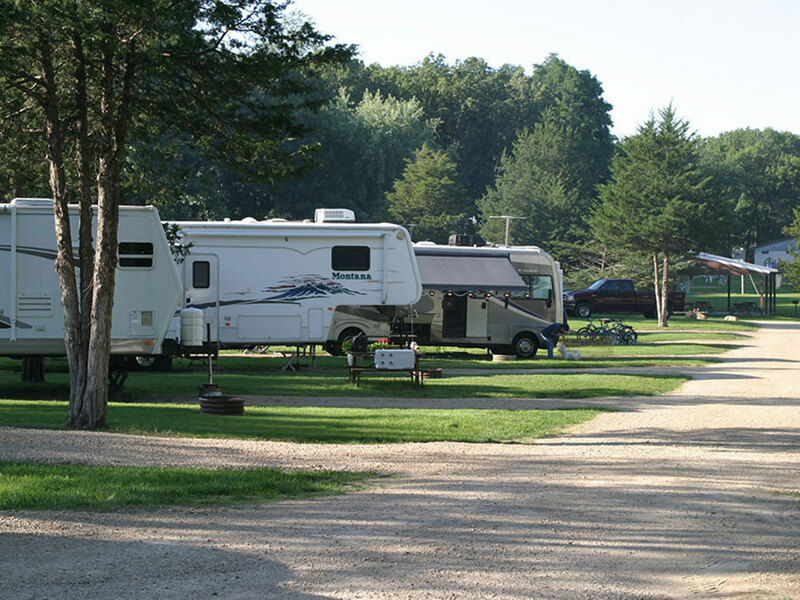 When we arrived at the campground, the overall impression was pleasant (tree-lined). Upon checking in, we were told they "do not have sites long enough to accommodate" our rig and that we would have to unhook. We weren't happy at that point because we always confirm this when we initially make a reservation for overnight stays specifically so we do not have to go through the hassle of unhooking and re hooking. We feel strongly that this should have been fully disclosed to us at the time of booking the reservation. We found the sites to be very tight, with just barely enough room to park a vehicle - in fact - our jeep was partially in the road as a result. The men's room/shower was dated, very dirty (showered at approximately 7:00 PM), you have to push a button for water to flow - then it releases a metered amount, which never did get hot. We realize that the campsite, like many, did not have cable TV available, which is fine, but we were unable to get ANY channels (prompt on brand new LG smart TV said "Can't find any valid channel! Check your antenna connection and run Auto Tuning again. " We checked the connection, which was fine on our end, but ultimately could not find even 1 station the remainder of the our stay. The same for the Wifi. We were able to connect by the logon provided to us - but several attempts to do a simple Google search on both an iPhone and laptop was unsuccessful, "Safari cannot open the page because it could not establish a connection to the server”. So, no TV or internet at all. There was a great deal of noise late into the evening as it appeared there were several buddy camping situations around us. Overall, the experience was not a good one - we were very frustrated and disappointed in this campground and would not recommend it. A very comfortable park, both for families and Old Fa*ts. A lovely pool, well-stocked store (with great ice cream treats), and great grounds including a playground, walking trails and Frisbee golf make it suitable for everyone. For the adults in the party, it is only a mile to a great casino. Baraboo is a super small town, with none of the flavor of nearby WI Dells (which is fine if you want resort-style attractions). The proprietor strives to make you comfortable.